Menopause generally occurs between the ages of 45 - 55 and can last up to a few years. For many women, this time of life come accompanied by a range of unpleasant and undesirable side effects, including anxiety and fatigue. Although these two problems have the potential to happen at any time during a person's life, menopause makes it more likely, owing to erratic hormonal fluctuations of this transition. Fortunately, there are a range of things you can do to reduce or eliminate menopausal anxiety and fatigue. Keep reading for tips on beating these symptoms. Anxiety is a relentless feeling of trepidation or apprehension, and there is often no apparent reason for the bad feelings. Sometimes, the anxiety can be triggered by things non-sufferers would think of as trivial, such as burning food or having an untidy house. The disorder can manifest itself differently in people, and where some people might withdraw and avoid social activity, others might have no trouble socially but are overly emotional, extroverted, or have sudden mood swings. Fatigue is a sense of exhaustion that is far beyond the normal ranges of tiredness felt by most. Of course, as with all menopause symptoms, fatigue can come in varying degrees, from a mild version when a person might simply feel more tired than normal after carrying out an everyday activity, to highly severe, when the fatigue makes it impossible to do anything and it starts affecting daily life. By making a few simple lifestyle changes, it is possible to beat anxiety and fatigue. 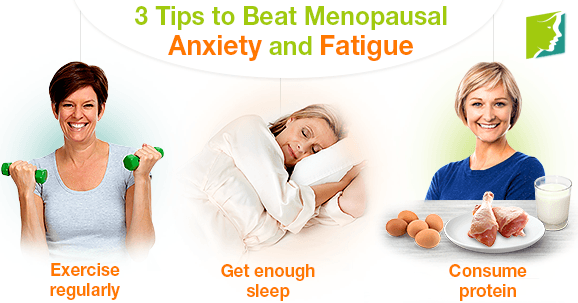 The following tips are lifestyle habits that you can implement to beat menopausal anxiety and fatigue. Routine exercise helps manage both anxiety and fatigue, both by releasing adrenaline into the bloodstream, which results in more energy, and by encouraging the production of serotonin, the natural happiness neurotransmitter. It is generally advised to get at least 150 minutes of high- to medium-intensity exercise every week, and this will be good for overall health as well as helping beat menopause-related anxiety and fatigue. Keeping up a regular exercise routine is a good long-term measure against anxiety and fatigue, but it can also help get rid of any symptoms you might already be experiencing. Lack of sleep often leads to irritability and irrational thoughts, so interrupted sleep cycles can worsen anxiety. By getting enough sleep, it should be easier to sift through and recognize when you are thinking irrationally, leading to a happier state of mind. In addition, it goes without saying that insomnia can also lead to fatigue and feeling tired during inappropriate moments during the day. Keeping your bedroom cool, dark, and quiet is one way to promote good sleep, and it could also be useful to avoid substances like caffeine or alcohol prior to bedtime. Eating enough protein can help counter the effects of anxiety and fatigue by providing the body with the nutrition it needs. Iron deficiency is one of the leading causes of fatigue, as without this mineral, oxygen cannot be effectively carried around the body. Consuming protein-rich foods - such as eggs, poultry, and milk - will help bring up iron levels. Studies have also shown that such foods can reduce stress, and therefore, your anxiety should also be reduced to some degree with a careful dietary change. Menopausal anxiety and fatigue both have the potential to lower quality of life and adversely affect relationships, so beating them as soon as possible is highly important. By making a few lifestyle changes, such as those mentioned above, you should see a marked reduction in your symptoms. However, this is by no means an exhaustive list, and there are many other changes you can incorporate into your life that could also be helpful.